Naval Architecture and Marine Engineering office, based in La spezia Italy, specialized in design and optimization of sailboat. Structural design, aero hydro design, deck layouts, rating optimization, performance improvements, project managment and yachts test. Cooperations with all the best designer, from Renzo Piano to Vismara Design. Italian Style and up to date engineering, especially for composite construction. 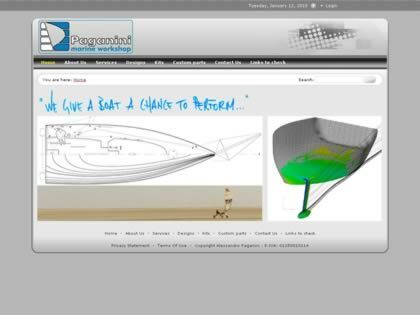 Web Site Snapshot: If available, above is a snapshot of the Paganini Marine web site at http://www.paganinimarine.com as it appeared when this site was added to the directory or last verified. Please Note that Boat Design Net has no involvement with the above web site; all content and images depicted in the above thumbnail are the property and copyright of Paganini Marine unless otherwise noted on that site. Description: Naval Architecture and Marine Engineering office, based in La spezia Italy, specialized in design and optimization of sailboat. Structural design, aero hydro design, deck layouts, rating optimization, performance improvements, project managment and yachts test. Cooperations with all the best designer, from Renzo Piano to Vismara Design. Italian Style and up to date engineering, especially for composite construction.